Trump said he accepts the conclusion of Russian election meddling. President Donald Trump said he "has full faith" in and accepts the U.S. intelligence community's conclusion that meddling took place during the 2016 elections as he prepared to meet with members of Congress at the White House on Tuesday. "I accept our intelligence community's conclusion that meddling took place," Trump said reading from remarks which came more than a day after he questioned their findings. He added that it "could be other people also. There's a lot of people out there." 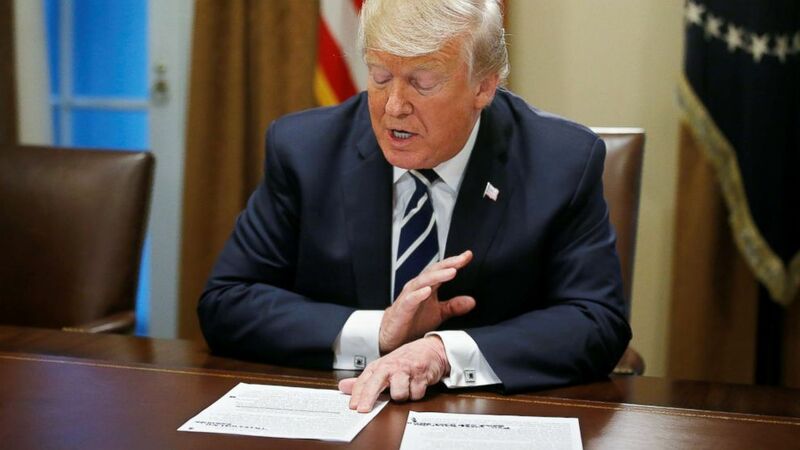 His typed prepared remarks included what appeared to be a handwritten note in black marker which read: "There was no collusion." Trump said he misspoke during Monday's joint presser with Vladimir Putin and meant to say there was no reason "it wouldn't be Russia" behind election meddling. (Leah Millis/Reuters) President Donald Trump reads from prepared remarks as he speaks about his summit meeting in Finland with Russian President Vladimir Putin at the start of a meeting with members of Congress at the White House in Washington, July 17, 2018. "I said the word would instead of wouldn't...I think that probably clarifies things pretty good by itself." At one point, the lights in the White House room went out as Trump made his remarks. "Oops, they just turned off the light," Trump said, joking: "That must be the intelligence agencies." Trump also defended his summit with Russian President Vladimir Putin, insisting it was a success in spite of the widespread political backlash at home over his remarks at a Helsinki news conference. "I think this was our most successful visit and that had to do, as you know, with Russia. I met with Russian president Vladimir Putin in an attempt to tackle some of the most pressing issues facing humanity," Trump said. "We have never been in a worse relationship with Russia than we are as of a few days ago, and I think that's gotten substantially better and I think it has the possibility of getting much better." 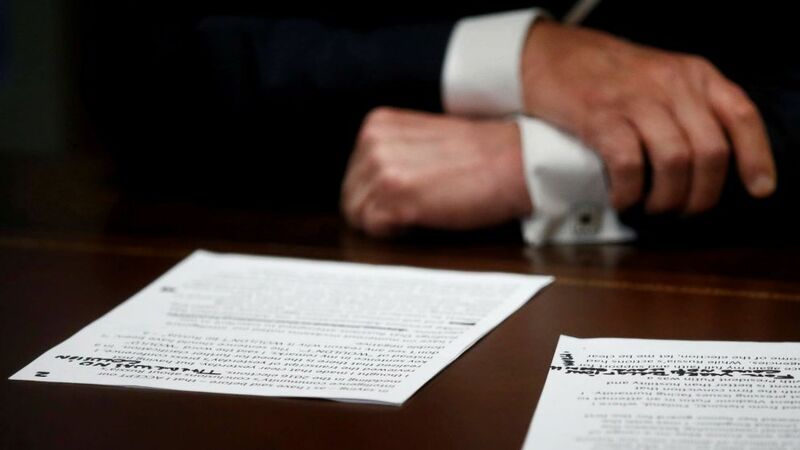 (Leah Millis/Reuters) President Donald Trump's prepared remarks show his own handwritten note "There was no collusion" as he speaks about his summit meeting with Russian President Vladimir Putin at the start of a meeting with members of the U.S. Congress at the White House in Washington, July 17, 2018. Later Tuesday afternoon, the White House circulated a press release of all the ways President Trump is "protecting our elections and standing up to Russia's malign activities," while also strengthening alliances and "troop readiness in Europe." The president drew criticism, even from some of his closest Republican allies, for his earlier comments during the summit's press conference in which he seemed to accept Putin's denials of election meddling in conflict with his own intelligence community's conclusion that Russia did, in fact, interfere in the election. Among the strongest rebukes of the president's performance came from close ally Newt Gingrich, who called for Trump to immediately correct what he characterized as the "the most serious mistake of his presidency." The president took to Twitter Tuesday morning to double down on his assessment that the meeting with Putin was successful, even more so than his meeting with the United States' closest allies at NATO. The president also offered thanks to Kentucky Republican Sen. Rand Paul, who was one of a small number of Republicans who offered a defense of the president. Meanwhile, some lawmakers have expressed concern over what might have been discussed between Trump and Vladimir Putin during the private, two-hour meeting in Helsinki. Senate Democrats are calling on the U.S. translator who was in the meeting to testify before Congress, "to determine what was specifically discussed and agreed to on the United States' behalf." "We're even more worried about what happened in those two hours when the president was alone with Mr. Putin," Senate Minority Leader Chuck Schumer told reporters during a press conference Tuesday afternoon. "Does anyone believe that he was tougher on Putin in secret than he was publicly?" Schumer is also calling on Secretary of State Mike Pompeo, DNI Dan Coats, and US Ambassador to Russia Jon Huntsman to testify before Congress. Schumer said he spoke with Coats Monday night, but he wouldn't share what was discussed. "This is too important not to get the full story out before the Senate," Schumer said. Senate Democrats are also demanding the administration turn over all the "contemporaneous notes" taken during the meeting.